If you feel like you’re entering a dungeon every time you walk down the stairs to your basement, you’re not alone! Many homeowners are not utilizing their basement space simply because they don’t know how to make it less like a cellar and more like a space they’d let their kids hang out in. The good news is that there are plenty of ways to brighten even the darkest basement corners. With a few tips, you’ll be able to enjoy a bright, cheerful basement in no time. 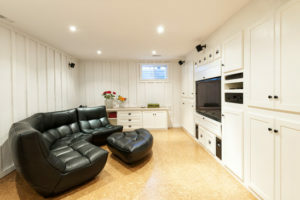 Read on for Marcotte’s tips on how to brighten up your basement. If you stick with greys and beiges as your colour scheme, your basement runs the risk of looking drab and dark. Using a bright, saturated colour will trick the mind into feeling like you are entering a well lit space. And don’t only think about the walls! Colour can be integrated through furnishings, rugs, or furniture as well. Open, expanded wall space will help to make your basement feel bigger and brighter. Consider taking out a wall or two to create a large, open living space. An open concept will allow whatever natural light you do have in your basement to shine throughout the space, and not get stuck in one room or corner. A crowded space (a.k.a one that is filled with stuff) is the opposite of what we want when we are trying to brighten up a space. Stacks of boxes only creates more dark corners for light to get lost in. When de-cluttering your basement, aim to clear all horizontal surfaces, and give every item a place. Built in storage units like closets and cupboards are a great way to conceal clutter and add to the style of the room. Because many basements have low ceilings, you’ll have to get a little more creative when it comes to selecting your light fixtures. Recessed lighting is a great way to conserve precious head space, while still illuminating your basement. You can also add in ambient forms of light (wall sconces, table lamps, etc.) to areas in your basement that feel especially dark. If you’re working with one small window in your entire basement, no amount of design tips will give you the same results that installing another window, or enlarging your current one will. New or enlarged basement windows allow as much as 40% more natural light and air flow in rooms, creating a healthier and brighter environment throughout your home. If you’d like more information on adding or enlarging basement windows, give the team at Marcotte Glass a call. We are Calgary’s window experts and can help make your basement a happier, brighter place!